Bibliographic Information: Nanclares, Silvia. La Siesta[The siesta]. Ills. Elatico Equipo.. Madrid: Editorial Kόkinos, 2007. Every day...after lunch, everything is calm and dark. And suddenly... an unexpected noise, a ray of light comes through the window...and at that moment, a mother realizes that she is alone with her child... hair and face, head and chest, back and arm, shoulder and hand, foot and leg. And then, she thinks as always...how wonderful it is to share her siesta! 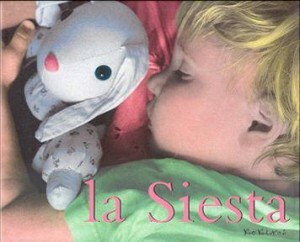 This book has been chosen because it focuses on the typical Spanish “siesta”, yet all children will be able to relate to a time when they have had a “nap” with their mothers. It is about the sensations, tenderness, and sweetness shared between mother and child; a simple and evoking text with illustrations based on coloured photographs that remind us of a wonderful shared moment.